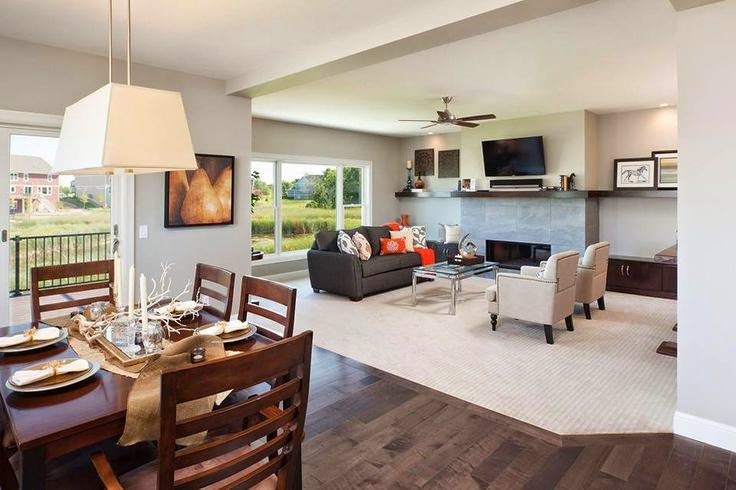 Many Indianapolis homes have large rooms and open floor plans that include carpet, hardwood and/or tile flooring. These are great for many reasons - they bring a family together and they provide a wonderful space for entertaining but they can be a tricky challenge for flooring. Continuous flooring is certainly an option but sometimes you want to visually divide spaces. Creative floor transitions are just what you need. And Indianapolis carpet, hardwood and tile store, Kermans, has just the design ideas to help you out. 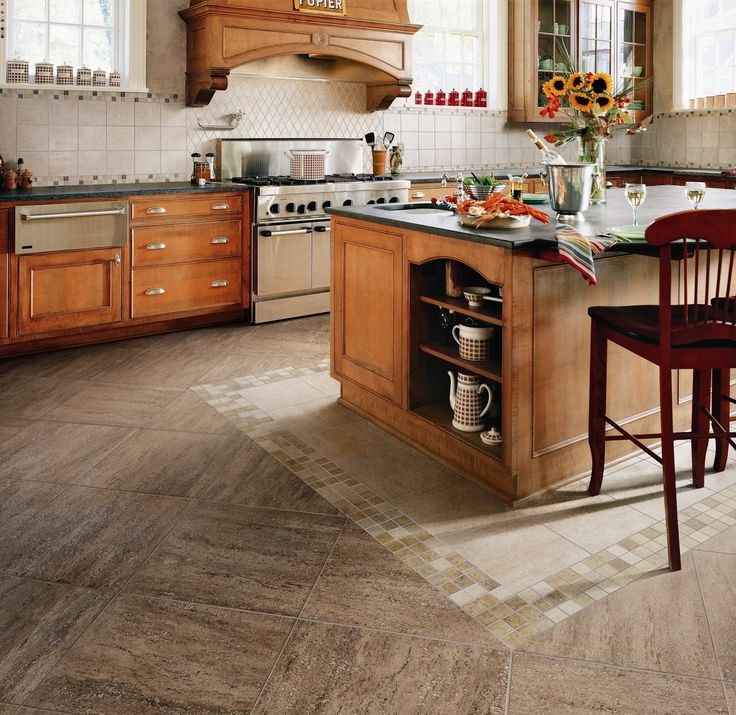 Tile is probably the most popular kitchen floor choice in Indianapolis homes. 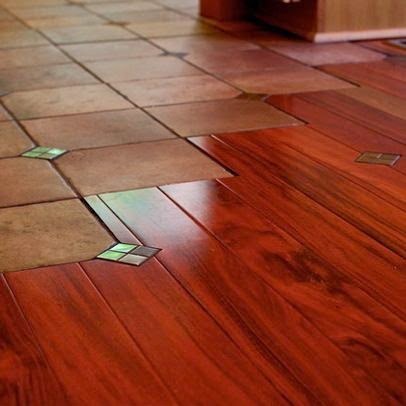 More and more often we're seeing homeowners want the convenience and look of tile but with a twist. As seen in the example above, different types of tile can be used in the same room with great effect. Here one type of tile is used to create an area rug feel beneath the kitchen island. It breaks up a large space, highlights the beautiful island area all with tile. Learn more about tile options from Indianapolis tile store, Kermans. Perhaps you have tile in your kitchen and hardwood in your great room. How do you go from one floor to the other? Check out the beautiful tile to hardwood transition below - the two floors literally flow together to both divide the spaces and pull them together. Above is one of the most practical tile to carpet transitions we've seen. 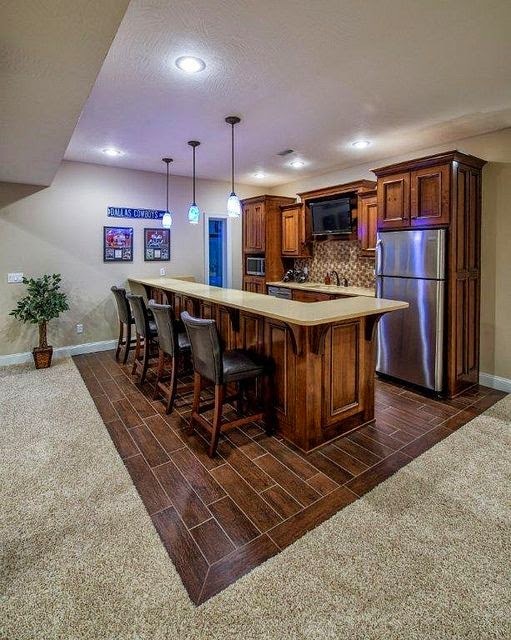 This bar is in a carpeted room but the homeowners don't want carpet beneath the bar stools or bar area - carpet that can stain easily and be easy to clean. Instead, they created an easy-to-clean "rug" with tile beneath the bar. The tones of the two different floors work well together and is much easier to maintain. Did you know that Indianapolis flooring store, Kermans, offers free expert design consultation? Whether your project is big or small, our design experts are ready to help you pick just the right tile, hardwood, and carpet for your budget and lifestyle. Bring your questions and challenges into Kermans and get the best Indianapolis flooring advice. 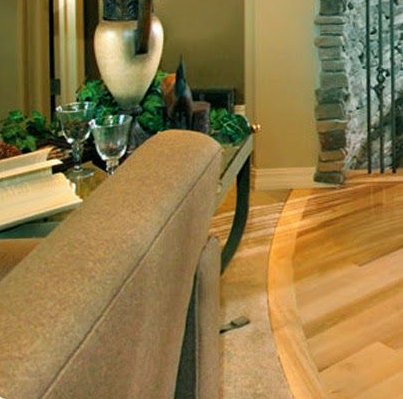 We can help you come up with these creative transitions and meet all your flooring needs. It's all part of the advantage of shopping at Kermans. Learn more about the Kermans Advantage. Ready for more creative flooring inspiration? Head over to Pinterest and check out our Flooring Transition board for great ideas! Your best source for carpet, tile and hardwood floors in Indianapolis, is also your best source for advice on tricky flooring challenges. Stop by our Castleton showroom to see our wide selection of flooring that fits any lifestyle, budget and home.